The word gumbo is derived from the term for Okar used by various Bantu dialects (Southern and Central Africa) such as quingumbo, grugombo, gumbo, gombo, ngombo gomboaud, ngumbo, ochinggombo. The word is one of very few African language words brought over by slaves to have entered the English language. Some of the others are goober or goober pea (peanut) also of Bantu dialect origin, Yam from West Africa, and cooter (turtle) of Bantu and Mandingo origin. Today, gumbo is, generally, a southern US regional term for stew-like dishes with meat or seafood, tomatoes and sweet bell peppers, but more specifically it is a Créole dish whose characteristic ingredients are okra and filé powder (although some gumbos do not have okra, and are thickened only with filé powder after removing from the heat). Okra has a mucilaginous quality which thickens and gives body to the gumbo. I agree with those who say "if it ain't got okra, it ain't gumbo!" Créole Gumbo is a stew-like dish made with brown roux, okra, filé powder, onions, green peppers, tomatoes and seafood, chicken and/or meat. Gumbo has an incomparably rich flavor and texture, and derives from the cooking traditions of the French, Spanish, Indian and African residents of the area. Ingredients can vary widely (there are literally hundreds of different gumbos). Seafood (especially shrimp) is common to many gumbos, and there is a special gumbo z'herbes (or gumbo maigre) made with herbs and greens (usually seven or more) such as collard greens, mustard greens, and spinach, which was traditionally served on Good Friday. Gumbo should never be over spiced, it should have a subtle flavor. 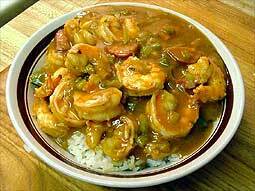 Tabasco sauce is always served with gumbo so those with a penchant for spicy foods can be accommodated. Gumbo is always served with rice.